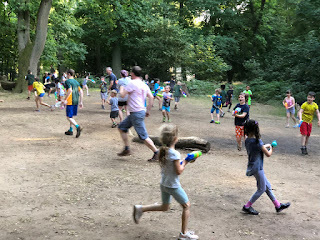 As is traditional, we met with Cubs from the 10th Oxford Pack for a great big water fight and BBQ (though this year it was not our final meeting of the term). We had around 60 Cubs/Beavers/siblings and at least the same number again of leaders and parents. It was a lovely warm evening and the Cubs quickly got very wet. We dived straight in with "Duck, Duck, Drench" then moved on to some very soggy relay races before our wild water fight (no Akelas were spared).